This past summer, a variety of exclusive buttons/pins were given to guests who attended the "Summer Play Days" (daily special events) at the Disney Store. 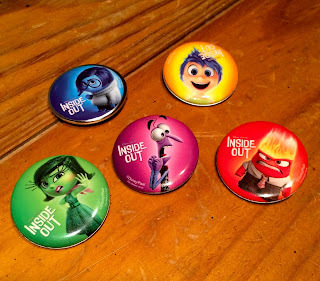 As shown on the flyer below, a new pin was available each week with a new category of characters each month- June Inside Out, July Marvel and August Disney Junior. Each button is about 1" in diameter. Between June 6th and June 28th 2015, you could collect all your favorite Inside Out emotions: Joy, Disgust, Anger and Fear! Sadness was also available- but only to Disney Visa Card members. Though I never attended any of the "Summer Play Days" events, I was recently gifted all of these pins! A big thanks to one of my Disney Store managers who knew I would appreciate them. If you're interested in tracking any of these buttons down, be sure to check eBay! There are lots of current listings.